D. The condition of President Monson. Pres. Monson has been showing the signs of his age (he turns 88 in August) and there've been rumors for a while he's suffering from dementia. He was able to give his talks at General Conference, but he only spoke twice, and we're just seeing him in his final days. By final days, I mean it could be years, but he isn't as energetic as he used to be. Pres. Monson will have the final say, but his counselors (Eyring, Uchtdorf) will have heavy sway, as will the senior apostles (Packer, Nelson, Oaks, Ballard). E. I'm not considering former presidents of BYU or BYU-Idaho. They already have Oaks, Holland, Eyring and Bednar in there. Adding a fifth would just be too much. F. I'm assuming that Packer and Scott and everyone else is still alive in October. If there were 2 or 3 Apostles that needed to be called in October, that would change a few considerations. G. Bottom line - it's up to the Lord. So, bearing that in mind, I'm going to look at the non-American candidates first and then the Americans. 1. ULISSES SOARES - I do think the next Apostle will be non-American, so this Brazilian seems like the ideal choice. He's in the Presidency of the Seventy, a position that has yielded many an Apostle. He's been a General Authority since 2005. His age is in the right range; he will have just celebrated his 57th birthday when October's General Conference hits. 2. EDWARD DUBE - The 53-year-old Zimbabwe native would make headlines. Good speaker, youthful energy and enthusiasm. He's only been in the 1st Quorum of the Seventy since 2013, but he was an Area Authority before that. He's also a convert, having joined the church in 1984. To have a black Apostle would send a wonderful signal for a church that banned blacks from having the priesthood less than forty years ago. 3. GERALD CAUSSE - He's been in the Presiding Bishopric since 2012, which is another body that's produced its share of Apostles. He's young (51) and while he's from France, he's more Mediterranean than Uchtdorf. 4. CLAUDIO R.M. COSTA - Another Brazilian, he might be seen as a safe pick since he's a little older (66), but he's been a G.A. since 2001 and he had a stint in the Presidency of the Seventy. 5. BENJAMIN DE HOYOS - He hails from Mexico. He's 62, about eight months younger than Bednar. He's been in the First Quorum of Seventy since 2005. Other possibles: Carlos A. Godoy (54-Brazil), Walter F. Gonzalez (62-Uruguay), Jorg Klebingat (47-Germany), Joseph W. Sitati (63-Kenya), Michael John U. Teh (49-Philippines), Terrence M. Vinson (64-Australia), Chi Hong "Sam" Wong (53-China), Kazuhiko Yamashita (61-Japan). 1. CRAIG C. CHRISTENSEN - He's been in the Presidency of the Seventy since 2012 and a G.A. since 2002. Before that he served as a mission president in Mexico City. He's 59, the youngest of the Americans in the Presidency. He's another Utah man, but if they stick with another American, it doesn't really matter what state he's from. 2. HUGO MONTOYA - He's 55, born and raised in California, but he is Latino and so would still be a historic calling. He's one of the youngest Americans in the 1st or 2nd Quorum of Seventy. 3. SHANE M. BOWEN - He's a young 60. 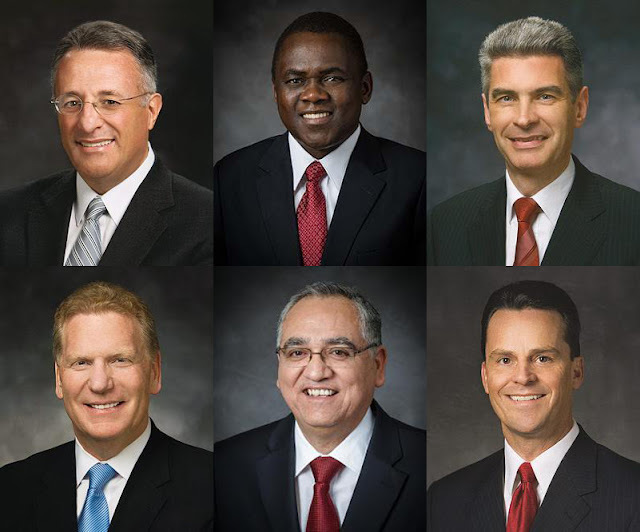 The native Idahoan has been a General Authority since 2006. He served his mission in Chile and was briefly imprisoned under the Pinochet regime under suspicion of espionage until they realized he was just a missionary. He was president of the Spain Barcelona Mission in 2000-2003. He was the president of Bowen Insurance. 4. L. WHITNEY CLAYTON - He's also in the Presidency of the Seventy, but his name is in the mix because he's a fiercely loyal bulldog for the Q12. He helped coordinate the excommunications of Kate Kelly and John Dehlin, so if he's selected, that sends a signal that the church is going to stay the course with how it deals with its critics. He's also a lawyer. 5. ALLAN F. PACKER - Yes, he's Boyd's son, but don't expect Boyd 2.0. We are a Church of legacy. There have been several father-son Apostles in church history. Both of M. Russell Ballard's grandfathers were Apostles. Packer will turn 67 in July, so he's another one where they're not positioning him to be the next prophet, but from what I've heard of those who've worked with Allan Packer personally, he's a very empathetic man, and he's a good speaker. Other possibilities: James R. Martino (54), Gifford Nielsen (60), Anthony D. Perkins (54), Ronald Rasband (64), Lynn G. Robbins (62), Gary E. Stevenson (59), W. Christopher Waddell (55), Scott D. Whiting (54).